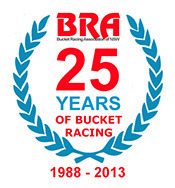 Round Two of the 2014 SAVA Tyres Bucket Nationals. 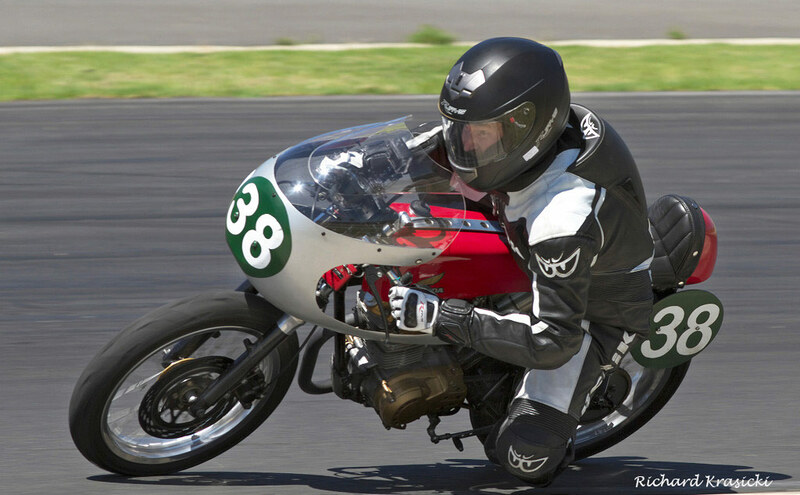 The SAVA Tyres Bucket Nationals was run over two meetings the first and last ones of the year and was organised by the St. George Motorcycle Club. 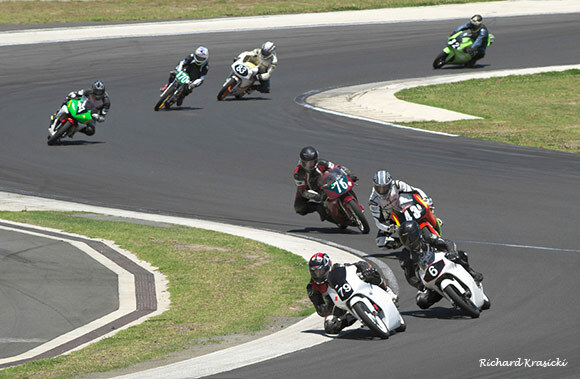 Round one was poorly supported due to it being on just a week before the first round of the six round BRA PCRA Championships held at Wakefield Park. 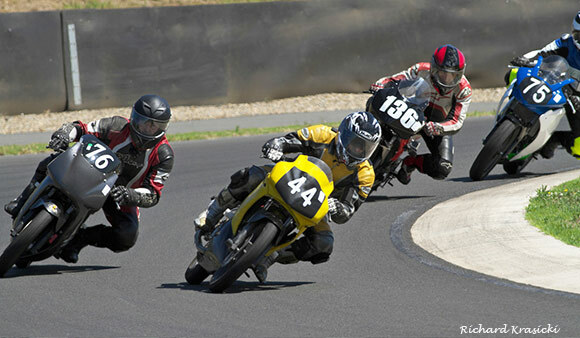 The second and final round Of the SAVA Tyres Bucket Nationals being the last race of the year had a much bigger entry but only riders who raced in the first round were in contention for the SAVA Tyres Bucket Nationals titles due to their extra points. A strong contingent of riders from the North Coast Road Racers club and Newcastle made for some close racing taking the top four places on the day. As in round one Newcastle rider #6 Jason Dunn (Honda RS85cr) was unbeatable winning all three races and scoring maximum points. 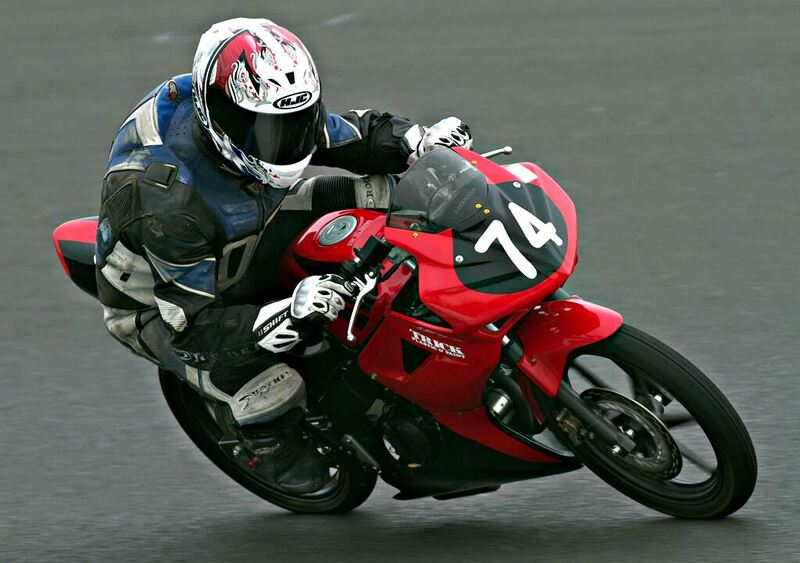 NCRR club rider #79 Raymond Skidmore on a BBE Honda RS 150 put in a determined effort to stay with Jason finishing an impressive second. Certainly a rider to watch in 2015. 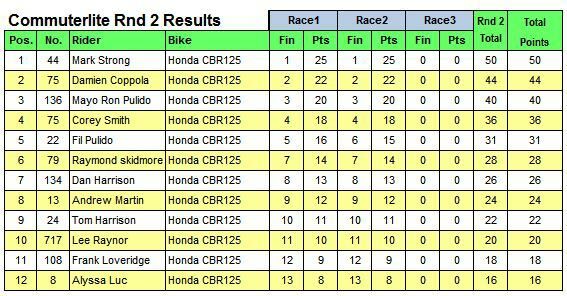 Other NCRR riders Damien Coppola and Dan May both riding BBE Honda RS CBR150s swapped places throughout their three races with Damien coming home third and Dan fourth. 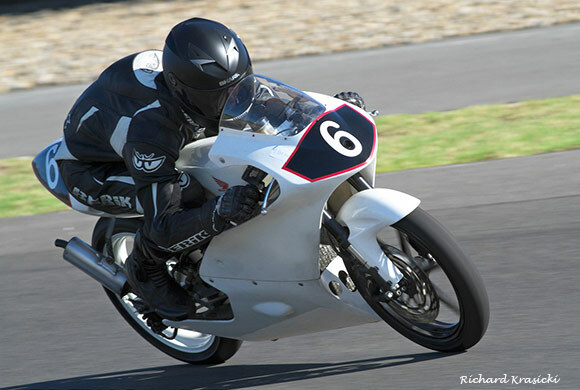 Greg Epis on his sons 85 Moriwaki finished 5th overall with newcomer #69 Beau Brannan CBR150 finishing all his races coming in sixth overall in his first road race. Both Edward Marsden RS85 and John Olip Moriwaki 85 both had DNFs which ruined their chances for a good result. Marty McGauley Honda RS85 struck problems in race two and had to park it for the day. 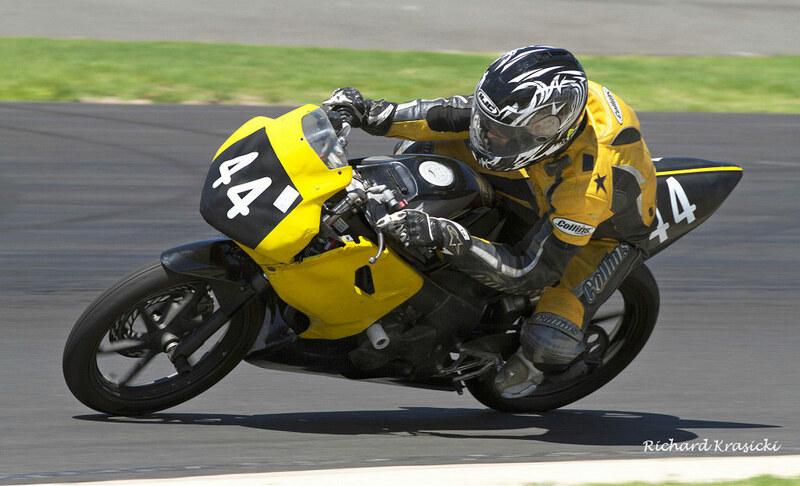 Round one Superlite winner Junior Murphy (Big Bang Engine Honda CB150) recoverd from a poor start to win race one from Queenslander Mark strong who was riding Fred Hollands Superlite Honda CB150. Ken Lindsay on his immaculate Honda RCB150 led the opening laps but was pushed back to second by Murphy who was on a charge. Mark Strong then pipped Ken for second on the final lap. Junior had one hand on the Superlite Sava Tyres Bucket nationals Trophy but the King was still in within striking distance should Junior strike trouble. Race two Mark strong got an excellent start and immediately gapped the field. 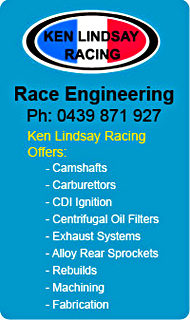 Ken Lindsay was in second with the slow starting Junior Murphy catching fast, slipping past the King on lap two. This was to be Mark Strongs last Superlite race as he is retiring and there was no way he was going to give up the lead without a fight. In the end Junior had to settle for second but the Superlite title was his with King Kenny third on the day and second in the title chase. John Olip and Jim Murphy fought over the remaining places with Jim Murphy ending up third in the Title chase. Johns DNF in race one didn't help his cause. The CommuterLites once again put on a great show of close racing with the retiring (from racing) Mark Strong proving the man to beat as he was determined to go out on top. 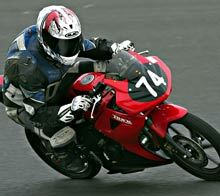 The whole field consisted of Honda CBR125's. 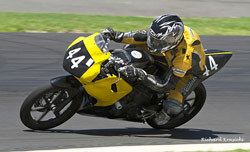 Race one saw #44 Mark Strong taking no prisoners on turn one, shooting into an immediate lead which he held to the end. Behind him though #76 Damien Coppola and #136 Ron Pulido, were engaged in a battle for the remaining podium positions with Damien grabbing 2nd place in the end. Number 4 Corey Smith and #22 Fil Pulido were also swapping places with Corey timing his run perfectly to pip Fil for fourth on the last lap. They were followed home by #555 Nicholas Miller who was showing good pace to finish 6th. with Raymond Skidmore 7th. In race two Mark Strong had to work a little harder as first time around #136 Ron Pulido was in front but Mark got the lead on lap two lost it to #76 Damien Coppola on lap three. Next time around though Mark was back in front and held it to the end. Meanwhile #79 Raymond Skidmore, #75 Corey Smith #555 Nick miller were running in close formation with Corey as in race one making the decisive move on the last lap to take fourth place for the second time and towing #555 Nick Miller along who also pipped Raymond on the final dash to the line. After such a strong showing in race one #22 Fil Pulido had struck a problem after lap one and saw him drop down the order to finish a disappointing 13th. 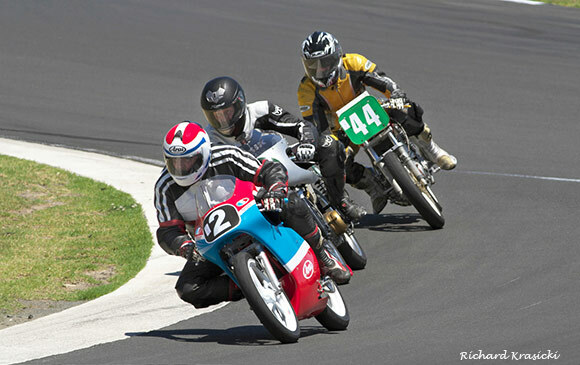 #2 King Kenny (Honda RCB150) leads #38 Junior Murphy (Big Bang Engines Honda CB150) and #44 Mark Strong in a tightly contested Superlite Race. Jason Dunn was uncatchable on the day and clinched the Motolite SAVA Tyres Bucket Nationals Title convincingly. Jason won all three races giving him the perfect score having won all the races in round one as well. Commuterlites in action #44 Mark Strong had a battle on his hands in race two with both 136 Ron Pulido and 76 Damien Coppola having a shot at the lead but in the end Mark put the hammer down to win both races and clinch the Commuterlite Sava Tyres Bucket Nationals Title..
#69 Raymond Skidmore (BBE Honda RS150crf) leads #6 Jason Dunn into turn two. They are followed by #43 and #76 Damien Coppola who had their own fierce battle for the final podium position.